Water moccasins, or cottonmouths (Agkistrodon piscivorus ssp. ), are one of the few semiaquatic pit vipers in the world. 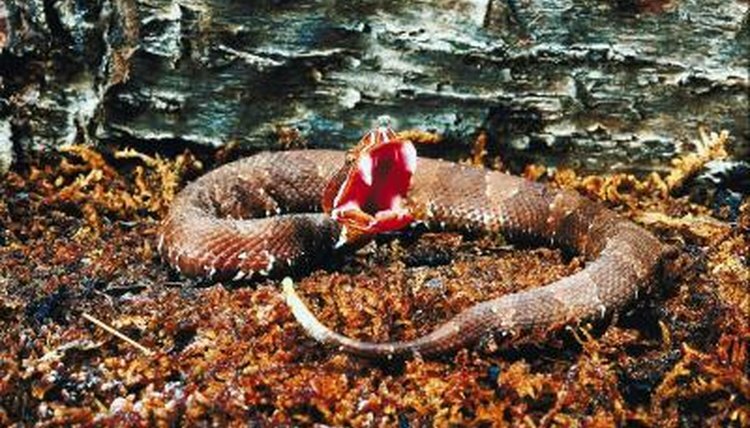 Though herpetologists consider them to be primitive pit vipers, cottonmouths have developed a number of adaptations, which have enabled them to thrive in the swamps and rivers of the southeastern United States. Cottonmouths use potent venom, heat sensing capabilities and worm-like tails to hunt a variety of prey, while their coloration and defensive displays help protect them from predators. Cottonmouths use long, folding fangs to deliver potent venom. They primarily use this venom to capture prey, but they will use it defensively as well. Cottonmouth venom varies slightly from one population to the next, reflecting the tendency for populations to concentrate on and adapt to locally abundant prey. While cottonmouth venom affects most animals, some -- such as the Virginia opossum (Didelphis virginianus) -- are immune to it. Cottonmouths -- like all pit vipers -- have two small depressions on their faces, located between the nostril and the eye. These holes detect thermal information from the environment and transmit it to the brain, where a “picture” is constructed. These allow pit vipers to find warm-blooded prey, but they also aid in detecting warm blooded predators and basking locations. Like their close relatives the copperheads (Agkistrodon contortrix ssp. ), newborn cottonmouths have sulfur-yellow tail tips. Young cottonmouths twitch and wiggle these bright tail tips to simulate a worm and attract frogs, salamanders and lizards into striking range. The tails gradually become darker as the snakes grow and rely on other strategies. Cottonmouths have incredibly broad diets -- scientists have recorded lizards, salamanders, insects, snails, birds, rodents, snakes, alligators and turtles among the gut contents of the pit vipers. Populations from different regions often specialize in a locally abundant prey. In central Florida, water moccasins congregate at drying water holes to gorge themselves on the trapped frogs and fish. Herpetologists observed a population in Texas traveling routinely from a swamp to a dry field to consume the numerous rodents. Cottonmouths living on Seahorse Key, off the coast of Florida, have adapted to eating the dead fish dropped or regurgitated by nesting birds. In 2004, Shawn E. Vincent and his colleagues from Tulane University in New Orleans, Louisiana, and the University of Antwerp, Belgium examined the differences in head size between male and female cottonmouths. The team found that male cottonmouths have proportionally larger heads than females do, and that their diet differs. While both species consumed fish more frequently than any other type of prey, the researchers learned that other reptiles -- largely snakes -- made up a more significant portion of the females’ diet than fish did. This variation in diet between the genders may reduce intraspecific competition. Cottonmouths camouflage very effectively in their natural habitat. Newborns and juveniles feature bold brown and black banding on their bodies, which disrupts their outline and allows them to disappear along the shoreline of lakes, rivers and swamps. As they age, their colors tend to fade and they become uniformly olive, brown or black snakes. When confronted by a predator, water moccasins will often gape their mouths, displaying the stark white interiors. This behavior has earned the snakes the “cottonmouth” moniker and a reputation for being vicious. However, work carried out by herpetologists J. Whitfield Gibbons and Michael E. Dorcas demonstrated that cottonmouths do not deserve this reputation. In their 2002 study, published in “Copeia,” the pair tested 36 cottonmouths by grabbing them with a simulated human hand. Contrary to the snakes’ allegedly bad disposition, only 13 of the snakes struck at the hand. Wetlands: Post-Drought Responses of Semi-Aquatic Snakes Inhabiting an Isolated Wetland: Insights on Different Strategies for Persistence in a Dynamic Habitat. ParcPlace.org: Is It a Water Moccasin?